Your confidence is well placed when you own an Outer Reef Yacht. 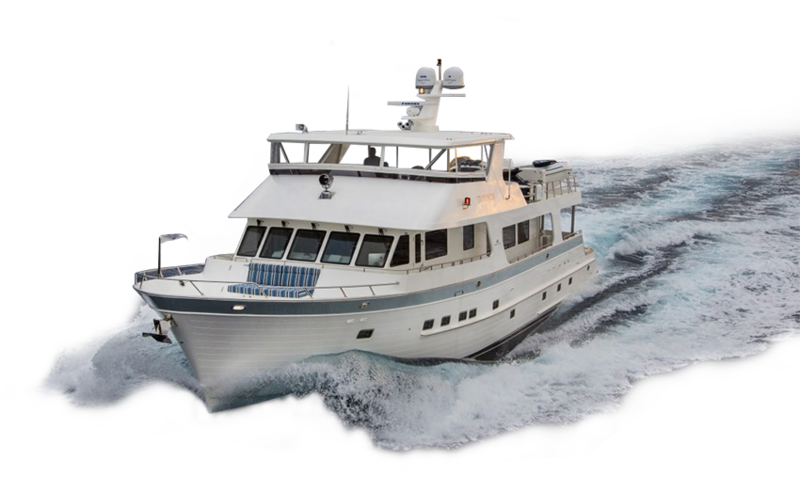 Dedicated to unmatched customer service, as well as building yachts of the highest quality, Outer Reef offers a unique combination of value, craftsmanship, and style. As a part of the Outer Reef family, you receive personalized attention from each facet of our business, and this unique quality is what sets Outer Reef apart from all others in the industry. Our time on the 630 included a short romp past Sydney Heads and into a slow rolling swell, just unsettling enough to have the stabilizers working when side-on to the sea... underway the Outer Reef is smooth and very quiet and no hint of vibration through the hull. It is an amazing process, we were able to see firsthand how such fine craftsmanship and technical expertise go into building our boat. The behind the scene look at how so many components are handmade, the high standards for quality and the attention to detail are one of the many things that stood out to us. Being able to tweak the design makes the boat very comfortable for long term cruising, comfort and ease of handling for a couple, as well of a sense of security for its sea keeping design. Overall we walked away with a much greater appreciation for the expert craftsmanship that goes into each Outer Reef. Outer Reef Yachts' shipyard places unmatched attention to detail throughout the build of every Outer Reef Classic Yacht. The experienced craftsman who bring each yacht to life are part of an experienced, generational family managed business. Each member of the shipyard team is dedicated to producing the highest quality product rivaling all top yacht builders in the industry. All Outer Reef Yachts continue to evolve and improve. Outer Reef is the new standard of which others are judged. They have a boat that is exquisitely finished and the personal touches give the owners a real sense of belonging. Outer Reef Yachts interiors are defined by owner's dreams. With an interior design and finish that impeccably reflects the owner's tastes, the Outer Reef team works to create your dream customized yacht. Our experienced, in-house designers listen carefully to your needs, to ensure your unique tastes and preferences are expressed elegantly and consistently throughout the vessel. Your Outer Reef is delivered turn-key and outfitted to satisfy your specific, on-water lifestyle. You never know what the future will hold. So when we built our 65 foot Outer Reef we did not anticipate that we would still enjoy cruising on her 10 years later. This would not have been possible without the quality of the boat and support of the Outer Reef organization. Outer Reef continuously sets the standard for after sale service and customer support. Whether you are the original or the fifth owner of an Outer Reef Yacht, all Outer Reef Owners are provided the same level of customer support and service. Customer satisfaction is our number one priority, and Outer Reef is proud to be consistently given the opportunity, by our owners, to manage further upgrades and sales. By doing so, Outer Reef ensures that each transaction is handled by the true Outer Reef experts, while preserving the resale value of each yacht. We realize the most critical part of the sales cycle happens after the delivery of your vessel, and we strive to foster our relationship with each and every owner, to ensure we remain a part of your next yachting chapter. I wanted to thank you for all of your help with the sale of the 65 Outer Reef to my client. You were a pleasure to deal with, helpful and very knowledgeable...this was a brokerage deal but Steven was treated like a new yacht buyer and felt like part of your family. After being in the new & brokerage sales over 37 years I can't say that I've ever been treated like I was part of the company doing a deal. You and Outer Reef have the buyers best interests in mind. Outer global sales network strives to provide all customers unprecedented, exceptional service and support. We believe that what makes an Outer Reef Yacht truly remarkable is the experienced team that stand behind the product, and we ensure our personal touch is provided within each corner of the globe, whether you are working with our dedicated representatives throughout the initial planning stages, after the delivery of your vessel, or formulating your plan for your next yachting chapter.